Processor: 1.3GHz Dual-core Intel Core i5 Memory: 8GB Storage: 512GB. MacBook delivers more performance in the lightest and thinnest Mac notebook ever. 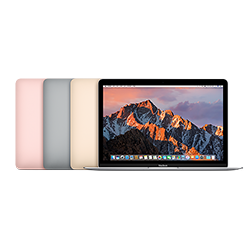 With new seventh-generation Intel Core processors, 12-inch Retina display, a full-size keyboard, force-sensing trackpad, versatile USB-C port, and all-day battery life, MacBook features big thinking in an impossibly compact form. Every Mac comes with a one-year limited warranty and 90 days of telephone technical support.